This past labor day weekend, we took the opportunity to go check out Iva Bell Hot Springs. 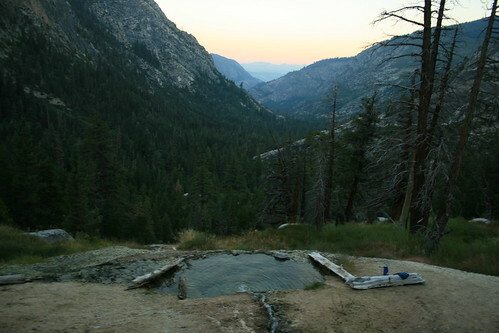 The hot springs are very remote, located at about 7,200 ft in the high Sierra Nevada in the John Muir Wilderness. 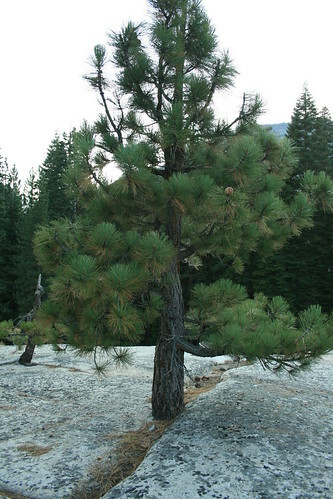 From the nearest trail head, it is a 13.75 mile hike one way! 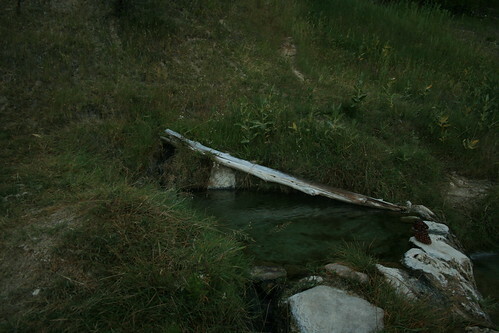 I've heard of people going to the springs when there was still snow in the mountains, but usually it is only accessible in the late spring and summer months. 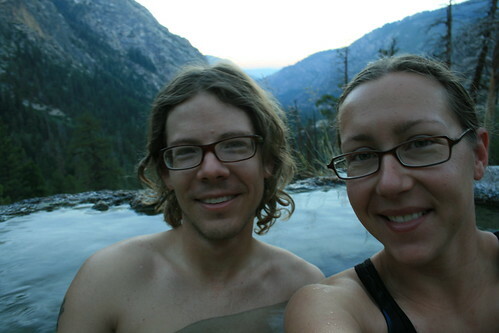 We heard about the hot springs at Iva Bell from an older couple we met while soaking at the Crab Cooker hot spring in the Long Valley one cold November night. They told us that they were hiking along a trail up near Red's Meadow in the 80s when they stumbled upon a set of pools in the wild. Nobody was there except them! When I got home, all I remembered from their conversation was the word Red and the word Bell. I tried looking in my California hot springs book for anything but couldn't find the spring they were talking about. Then I kind of forgot about it for about half a year. 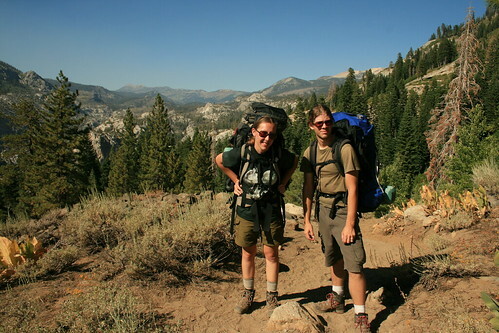 Then I stumbled upon a blog online which was about a couple's PCT/John Muir Trail hiking journal. 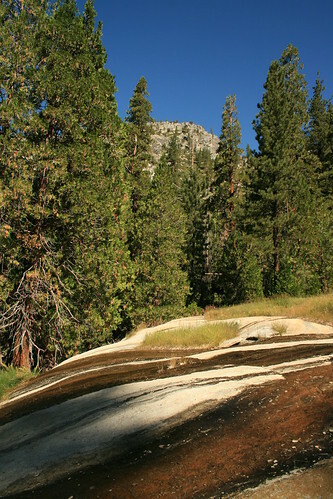 They mentioned a bathhouse which had showers fed by 100% hot spring water at a place called Red's Meadow campground near Mammoth Lakes, CA. That was a clue! I went on an internet researching frenzy typing in "Red's Meadow hot springs Bell" and finally found the spring that the couple found in the 80s. It is different than the spring that feeds the showers. After identifying the name and location of Iva Bell hot springs, I still couldn't actually find it in any hot spring guide. I guess its a word of mouth type of place. The spring is not marked on all maps either like others are. Well, after finding out everything I could, we were ready to try and find it for real! But we needed a long weekend to do it because we wanted to take two days to reach the springs, hiking between 5-8 miles per day, and two days on the way back. That meant we needed a 4 day weekend to do the ~27 mile hike, so we ditched school on Friday and created our own 4 day weekend out of labor day weekend. 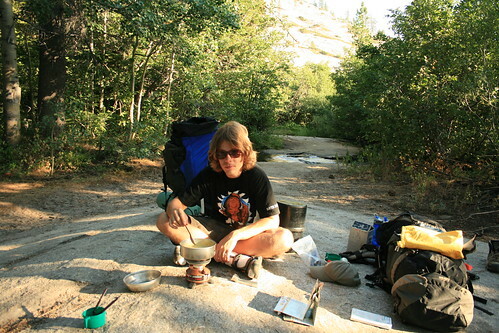 Tired Romy making a pasta dinner near the creek we camped at the first night. A few days before we left, Nicole called me and said that they were canceling their trip to Canada because of hurricane Earl, which was causing bad weather all along the East coast where they were planning to be vacationing. Instead they found cheap tickets to L.A. and were wondering what we were going to be doing over labor day weekend. I told them our plans to hike to the hot springs, and they wanted to go to, but they wouldn't be able to start the hike until Saturday morning, while we were going to be starting Friday afternoon. 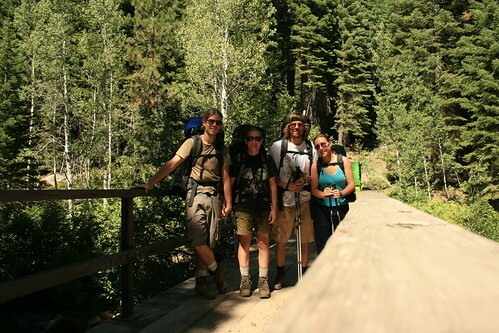 In order to make it to the springs with us, I told them they would have to hike the entire 13.75 miles in one day! They were okay with that so we made plans to meet up. We also made a plan B and a plan C. Just in case. 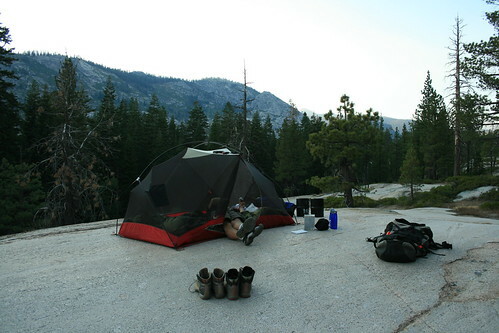 Our camp site on top of glacially polished granite. 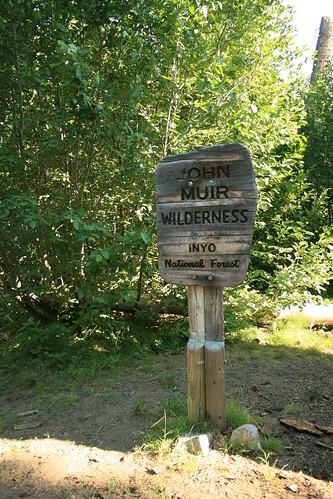 Before heading into the John Muir Wilderness, where the springs are located, you need to secure an overnight camping permit from the ranger station. We got one almost last minute, and we were really happy that they had some left, being a holiday weekend and all! I think they only let 25 people stay in the JM Wilderness each night. Also, the bear box idea is going viral, so they also required all overnight hikers to store their food in bear canisters, which they rented out for $5 at the ranger station in Mammoth Lakes. A pine tree growing out of what looks like solid rock! So crazy! We started out the hike in Red's Meadow. In the summer, there is a mandatory shuttle which takes you into the Meadow. The same shuttle also goes to Devil's Postpile National Monument (which we didn't have time to see it though). After getting tickets on Friday afternoon, we hoped on the shuttle and asked to be dropped off at the Rainbow Falls trail head (also the Fish Creek trail head). The Fish Creek Trail is the one which goes all the way to Iva Bell hot springs, but the first mile of it also serves as a trail to Rainbow Falls, a nice waterfall near Red's Meadow. Its a very busy part of the trail, but after you get through it, the people disappear and we were basically alone. In fact, as we hiked to our first camp site, we didn't see anybody else the entire time! It was really hot when we started out. The first part of the trail goes through an area burned by a wildfire over 15 years ago. But it is still really bare with no new trees, just short scrubby bushes. The burned trees stood like masts in a sea of bushes and charcoal. We had a couple miles of this until the trail dropped down into the regular vegetation. Then we passed a dense area near a stream, and off in the distance, we heard a thump thump thump! It was a black bear and we scared it and it was running off in a crazy dash, kicking past downed logs and bushes making all sorts of noise! I guess we were not expecting a bear, and we were glad that it was more afraid of us than we were afraid of it! On our second day of hiking on the Fish Creek Trail, still a bit chilly out in the morning! 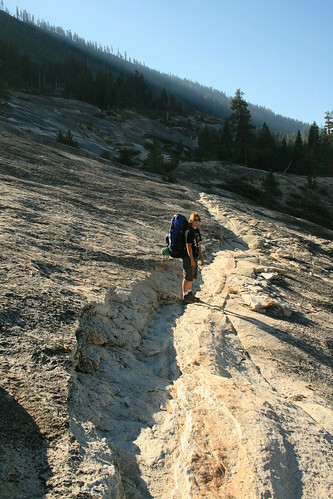 The trail then started heading for open and exposed granite, typical of the Sierra Nevada. We were nearing the 5 mile mark since we left the trail head, and since we had a long day already just to get to Red's Meadow from Oakland (we headed out of the house at 5am), we started looking for a good camp site for the evening. We soon found one near a creek which was feeding a waterfall farther down the trail. We spotted a nice flattened piece of glacially polished granite. It was literally like camping on top of a granite counter top, and it was shining in the sun. As the sun set, all of the heat that the rock absorbed during the hot day from the sun was radiating out of it. It was like sitting on top of a heater. We built our tent and relaxed. We were both pretty tired. The rock heated up our sleeping pads and we were so warm all night. The next morning, as we packed up our tent, we felt the rock under where we had the tent and it was still warm! The rock that was exposed to the night air was cold at the surface, but under the tent it was nice and toasty! Some of the trail was cut right out of the granite! After breakfast we continued hiking. We had to go almost 9 miles that day to make it to the springs. We hiked through come beautiful country, granite domes, and tall pine forests. Then we descended almost 1,500 feet of switchbacks down into Fish Creek Valley along which ran the Fish Creek, where the trail got its name from. We got to a big wooden bridge called Island Crossing and took a long rest there. It was peaceful. We were just relaxing with the sound of the creek rushing under the bridge. The water was crystal clear. But it was time to move on because we heard the springs calling to us! We only had about 4 miles to go! Fish Creek at Island Crossing. Boy did the last 4 miles seem more like 10! We had to ascend almost the entire way up back to about 7,200 feet, which is where we were before we descended all of the switch backs just a little earlier. Somewhere I read that the trail was mostly downhill. How did that person figure? We started the trail about 7,000 ft and we were going to end at about 7,000 ft at the springs so that's impossible. I guess you can't believe everything you read on the internet! But we were so close and we passed a few people hiking out the springs, each telling us that when we get there, we will reach paradise. We couldn't of been more motivated to keep on hiking! We heard from other hikers that the springs are not obvious from the trail at all. 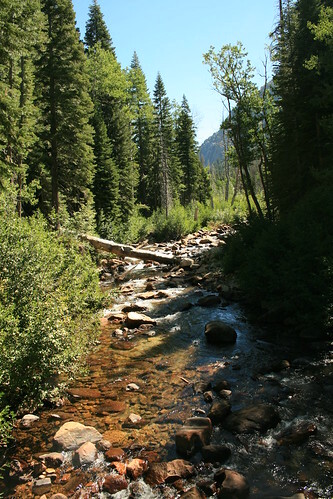 Once you get about 4 miles beyond the wooden bridge, there was a sign nailed to a pine tree which read "<--- Fish Valley, Goodale Pass --->". At that point we saw a small creek that we were instructed to cross over on a log. After that, we should see a few foot trails going up a hill. We followed one of the foot trails, which led us to a clearing. Except the clearing was filled with cascading water, flowing over rounded granite boulders nestled in lush grasses and wildflowers. Suddenly it seemed like all of the birds began to sing and we just kept hiking up, and up and up. We passed by a huge house-sized granite boulder, and came upon the first pool! View of the morning sun coloring the distant ridges from the middle pools at Iva Bell. The trail criss-crossed through the wet lush grass, and we walked through it to get higher up the mountainside where the other pools were located. Under the lush grasses was cascading spring water. It almost completely saturated the clearing. A small and very steep trail led us higher up the mountainside and soon we found the middle set of pools. They had an awesome view of the entire Fish Creek Valley. Cascading spring water and lush grasses at Iva Bell. Being a holiday weekend, there were many other campers around. We counted 20 people including us! But everyone was tucked away in secluded camping spots, so it didn't seem like a metropolis. We were lucky to find the last camping site near the middle pools, so we snagged it and took a break. But it was the middle of the day so it was pretty hot to go into the hot springs yet. So we had a late lunch instead and contemplated whether of not we thought Nicole and Marcel would make it this evening. They started out the trail this morning, after an all night drive from L.A. We crossed our fingers for them! In the mean time, we escaped the heat of the open clearing where the hot spring pools were by hiking back down to the main trail and sat next to the Fish Creek. We sat there for a couple hours actually, just relaxing. We decided that we would wait for Nicole and Marcel until it got near dark out. We talked about a lot of unimportant things to pass the time, and dipped our feet in the creek. Then when the sun dipped behind the trees, we hiked farther down the trail to find an area we at first complained about because of the lack of shade. Now we wanted to catch the last rays of sun to keep up warm while waiting for N&M. Another turquoise pool at Iva Bell. To our amazement, at about 6:30pm, we heard a yell from the trail, "Hello!" It was N&M and they were a little earlier than we were expecting them! They made it! 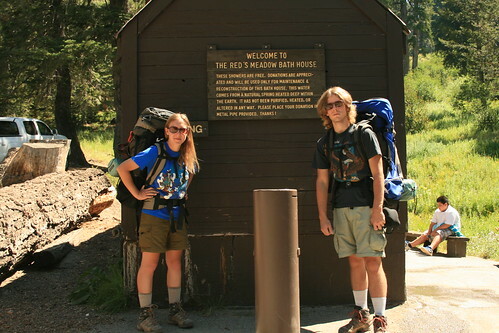 We took their backpacks and helped carry them back up the steep trail up to the middle pools where we were camped. They were so exhausted that they didn't even eat much of dinner (broccoli and cheese rice-a-roni). But as soon as it got dark, and the air temp cooled to a pleasant 50 or 60 degrees F, we got in one of the three middle pools. Other people were in the other two pools, but they were in there for a while already and soon left when we got in. So we basically had the entire set of pools to ourselves for the whole night! The water temperature was slightly over 100 degrees. 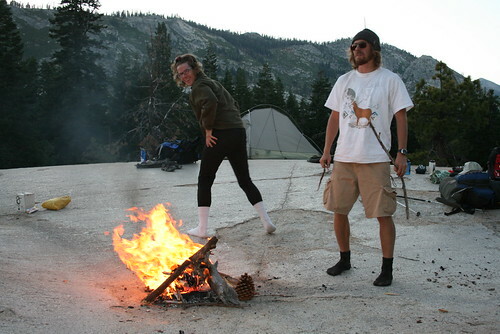 We heard from some campers that had been to the springs long time ago that they used to be hotter, more like 110 degrees F. That's a better temperature for a hot spring in the dead of winter, but 101F was okay for cooler summer mountain nights. However, it was not hot enough to prevent bugs and other small floating things to die. So we were swimming with other life forms that evening too. But it was dark, so. . . 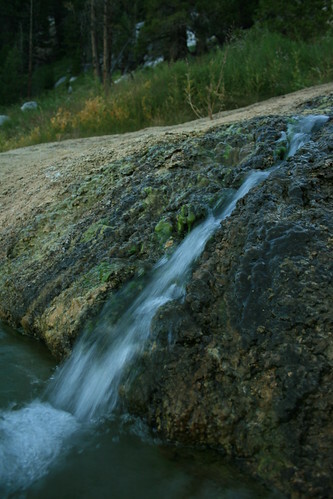 Hot spring water cascades from one pool to another via small dug out channels in the earth. We saw the sky covered in stars, and the milky way was thick and bright. We even saw 4 shooting stars! What a nice end to a full day of hiking! We had finally made it! It was so peaceful. Taking one more dip in the morning! When we got out, we were pretty warm and dried off quickly. Then we stumbled back to our camp site and got into our sleeping bags for the night. Romy and I bivouacked instead of building our tent. N&M slept in their tent. It was a warm night. The next morning, when the sun came out, I woke up Romy and we went back into the hot spring one more time. Then we came back and had coffee and breakfast. Then N&M woke up and we all went back into the hot spring again! For all the people camping nearby, we were still the only ones out that early in the pools. It was nice! Everyone was still sleeping. Once the sun came up over the mountain ridge, we felt its heat and knew it was time to start packing up. We only had a short time at Iva Bell, but it was worth every mile! However, I wish the water was slightly hotter. There are supposedly two more pools even higher up the mountain which are supposed to be nicer, but we never hiked up there. Next time! N&M hiking past the middle pools out of the Iva Bell area. Now we found ourselves hiking back, our third day. We wanted to take it easy, so we made sure to take plenty of stops. We hiked about 2 miles and took a long break. Then we hiked another mile and it was getting really hot out already, so we took another break to go swimming in Fish Creek. It was really refreshing! We cooled off, which was good because we had a lot of switchbacks in front of us. Soon we crossed the wooden bridge again and started our ascent. It was a whole bunch of up with a lot of steps! Somewhere half way up, a cowboy on a lone horse was coming down the switchbacks. We moved off the trail into the bush to let him and his horse pass, but he insisted that we pass and he would ride the horse off the trail. Poor horse! It was so scared! First of all, the trail was very thin and narrow, and second, the horse was big! And third, the mountainside was extremely steep. But he pulled the reins and told the horse to basically step off the trail and onto the steep mountainside. The horse was so scared its eyes got super wide open and almost refused to listen to the cowboy. But finally, after a lot of slipping and turning around, it stepped off the trail and let us pass. Then we told the cowboy that that was kind of crazy, and he told us is a hilly billy accent, "Oh, its normal." On the wooden bridge at Island Crossing. After what felt like forever of going up, we finally reached the top! We drank almost all of our water though, so taking a break was just for the muscle relief. There was no water for another two miles. We relaxed and cooled down in the shade, and then continued to cold creek, the first place we could fill up on water and eat. But the hike up all of those switch backs exhausted us all and the two miles to cold creek seemed to drag by. When we finally heard the rolling creek, we perked up and hiked a little faster. Finally we made it and collapsed on the pine needle covered ground under the trees. We busted out our lunch, but it was already after 4pm! We had beef jerky and cheese, chocolate, hazelnuts, and a cookie. We also munched on a tomato. Are we at cold creek yet!? The good news was that we were now full of food, hydrated, and only a mile or so away from where we wanted to camp for the night. When we got to our camp site (the same place we camped the first night) we collected some fire wood and set up camp. We were still full from our late lunch, so we just relaxed and made a fire. Then later in the evening, we made a small dinner. The fire was hot since the wood around us was very dry. We made the fire in a little depression right on top of the granite, and sat around in our socks on the smooth warm surface. It was like nothing else ever before! What a luxury to not be surrounded by dirt ground but instead clean smooth warm rock. 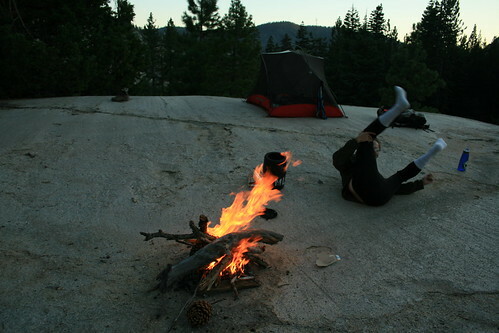 Romy being silly and rolling around the camp fire in his socks and thermal long johns. What is going on!? I don't know but this is an epic picture! The next morning, we had only 5 miles to go back to Red's Meadow where we planned to take a shower in the hot spring fed bathhouse! It was a easy hike until it suddenly started going up hill a lot! Then it was tough, especially the uphill sections at the end! We were so near the resort but the trail kept going up! Ahhhhhhh! We now all hiked 27 miles, and we ended it with a bang I guess. Finally we crested the "summit" and found ourselves at the Red's Meadow Resort. Marcel joked that he expected a large lodge with antler chandeliers and deer heads mounted on the walls. We found some cabins, a small store and cafe made from log cabins, and a campground. But most importantly, we found the bathhouse! There were about 6 showers, which flowed into concrete tubs in private rooms. When you turned the spigot, the hot water ran out and it was steaming hot! We cleaned off all of the dust and grit of the trail for the past four days. How nice! Then once we were all clean, we headed to the nearest bus stop and took the shuttle back to Mammoth. All clean after a shower in the hot spring fed bathhouse at Red's Meadow! And that was the end of our 27 mile round trip adventure to check out Iva Bell Hot Springs! It was nice! Thanks for sharing such a great trip, I'm jealous! I've been to fish creek many times but not that way and I've backpacked a lot of the mammoth area. Once again thanks for sharing!! The showers at Red's Meadow campground were working? I have never seen those things operational! Nice Report! Thanks..Until the campfire spot. You know you only build those where there is an existing fire ring? So even if there was an existing you would not want it on a piece of polished granite. Thank you for the report. I used it to help plan my trip. We went there last weekend--was supposed to be 6 of us, but only 3 of us ended up going. Your report was very useful. We only made it to the lower pools, as when we got there we were told the camping at the middle and upper were already occupied. As we only had one afternoon there, we did not explore much. Great read. 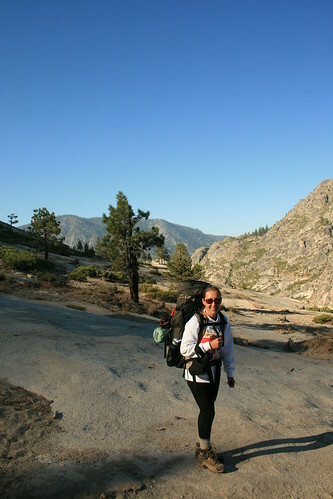 As you were doing this 7 years ago I was just finishing up the John Muir Trail, coming down off Whitney, the experience of a lifetime! But I've never been to Iva Bell even though hearing about it for years and years. Now this Sept (2017) I'll be in the States for the first time in 2 years and think I'll give it a try. Your description really will be a big help, thanks!